After a rather full weekend of packing, saying goodbye to everyone and making arrangements for our apartment so it doesn’t remain unoccupied for the coming 5 months we are almost ready to get going on Monday morning. Almost, as there is in the back of our minds still an uneasy feeling: are we really going to do this? Are we truly ready? Will it be everything we hoped for? 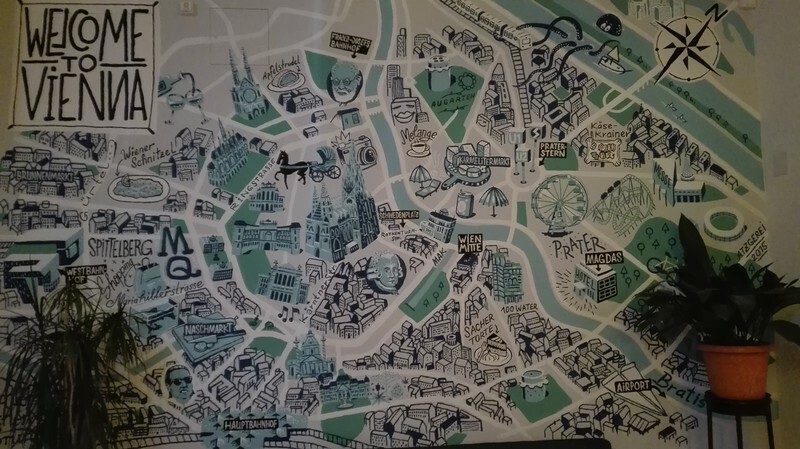 It is a strange mix of anticipation and anxiety that fills our hearts as we say our last goodbyes to the family that has come to see us off. But in the end we hit the road. Our planned route should take us out of Belgium on the Motorways and then on to a mix of some Autobahn and smaller roads through Germany. We need to be in Vienna on Wednesday morning if we still want to meet with the consul for Turkmenistan in person. Sofie has been in contact with the Turkmen embassy in Austria for some time, after the embassy in Brussels informed us they were having computer issues and would not be issuing visa before May. We basically got the “computer says no” response in Brussels. The Austrian consular section was a lot more friendly and helpful, allowing us to submit all of the required paperwork electronically. We would be receiving an authorization letter from them as soon as the Turkmen ministry of foreign affairs gave the ok. We hadn’t received anything yet by Tuesday evening, so we are hoping that a personal visit and a big smile would help move things along. When we get there, the consul speaks very good English and receives us warmly, despite obviously suffering from some sort of allergy at the moment. He explains us again what he had told over the telephone and email conversations, that he had forwarded our request and there was nothing to do but wait. But he would make sure we were at the top of the pile. A response should be forthcoming by the end of the week or early next week at the latest. He seems very confident so we get a good vibe. He also assures us that with the authorization letter we can get our transit visa at any Turkmen embassy around the world or even simply at the border. We were hoping to get it a bit sooner, but at least we are able to meet the man in person and thank him for being so friendly and helpful. Not all embassies are this clear and pro-active in their communication. So we just hope to get the letter soon. There’s a Turkmen embassy in Ankara where we could get the stamps in our passports, or maybe in Tehran. We would prefer to have the stamps before we get to the border, as we have read mixed reports on getting things sorted at the border itself. And besides crossing northern Afghanistan, the only alternative for getting to Uzbekistan is a very long detour back around the Caspian Sea, or an unreliable Ferry from Azerbaijan (for which we don’t have visa either) to Kazakhstan. Anyway, those are worries for later, right now we are still just crossing Germany. It is bitterly cold and it started raining. While riding through the Hautes Fagnes in Belgium and the Eifel region on the German side, we still spot a lot of snowy patches next to the road. The CEL indicator on my bike is blinking continuously. It only does that at temperatures below 4°C. 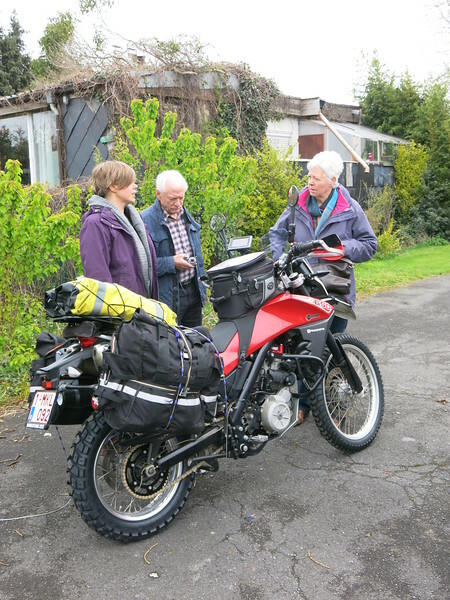 So when we pass Bitburg around noon we ride into the city center for fuel and to warm up with some hot soup. A nice Bierstube provides just the right cure for our pain. It doesn’t look like the rain will let off soon and the ride so far has been pretty grim and miserable. The ride along the Autobahn is pretty boring and when the rain eases off a bit we get onto some smaller roads around Kaiserslautern. A little before 4PM we stop for another break in a small village bar. Sofie notices here arm is a bit wet. Apparently some water has been seeping through the ventilation zipper of her supposedly waterproof Klim suit. She’s definitely not happy. In the bar we have another bowl of hot soup and impress the local elderly bar regulars when we tell them we are heading for “Die Mongolei”. At least it is completely dry again when we set off. Near Neustadt we even see a few timid rays of sunshine through the grey cloud cover. 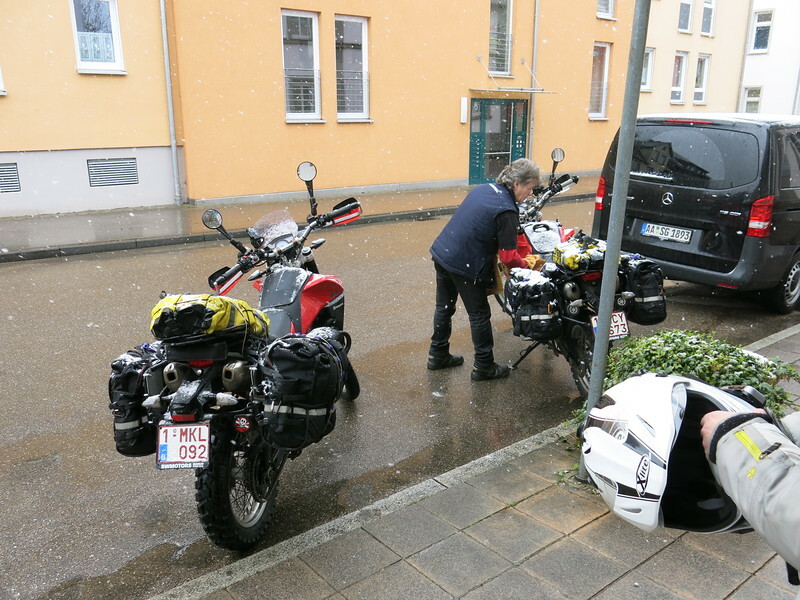 It does not last though and when it starts to rain again we decide to just stay on the Autobahn and get to Ellwangen, where there’s sure to be some accommodation to be found with a hot shower. We don’t even have to look for long. 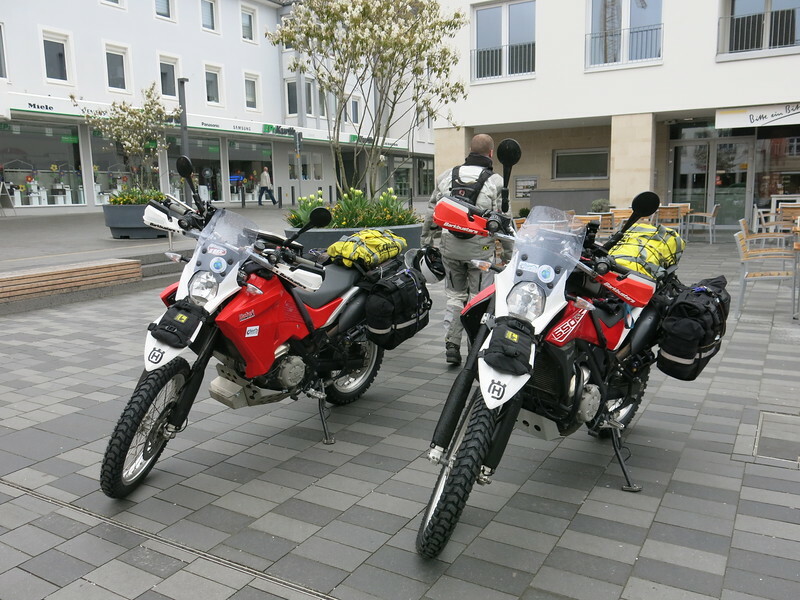 Hotel Germania is at only a 2 minute walk from the lovely city center and the hotel manager assures us he will personally look after our bikes. After getting cleaned up and warmed up in the shower we walk into the center of town looking for a place to eat. 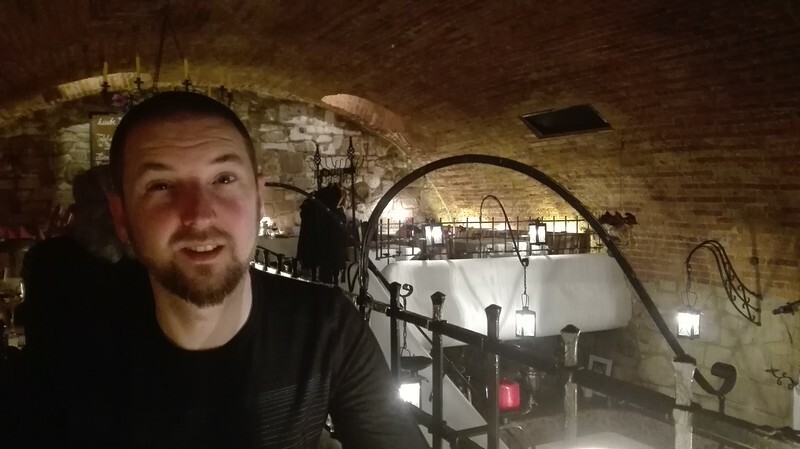 We end up going to the restaurant recommended by the hotel manager, a quaint restaurant deep underground in an old cellar at level -2. It is very cosy and the game we have is delicious. By 10PM we are ready to hit the sack, but not before we arrange for some place to stay in Vienna. The next morning we wake up early. When opening the shutters there’s a surprise waiting for us outside: it’s snowing! Not a very promising start of the day. After breakfast we get packed, as we really want to get to Vienna today. The hotel manager even comes to clean the snow off our bikes with a rag while we are putting on our helmets and gloves. Because of the weather we decide to just take the Autobahn the entire distance to Vienna. It will be boring, but it beats suffering on the smaller roads being cold and wet the entire time. We are hit with all kinds of rain, snow, sleet and mist along the way. The heated grips are on continuously and we’re still cold. Again the temperatures don’t rise above 3°C for quite some time. The snow cakes to the helmets and we have to wipe it off every 10 seconds to keep a view on where we are going. The hot goulash soup for lunch is a god-send. Even though we had already stopped once for a hot chocolate before. When we cross the Austrian border, it finally stops raining and by 4:30PM the sun comes through! The bad weather is also really bad for our tempers, but when we enter Vienna it is close to 20°C and sunny, so the suffering is soon forgotten. We make our way through the center towards the hotel we had booked earlier. Hotel Magdas is basic, but very clean and a bit quirky in its use of modern furnishings. And it also has off-street parking for our bikes. In the evening we treat ourselves to the most surreal dining experience we have ever had. 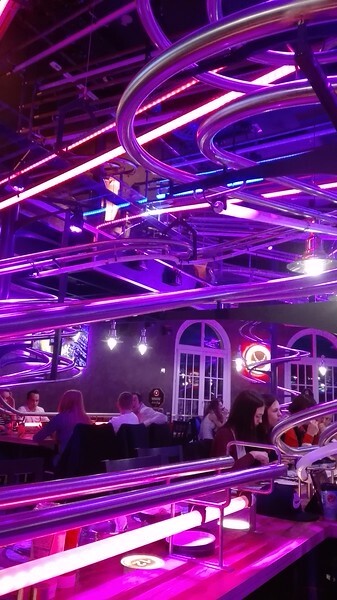 The roller coaster restaurant looks more like a discotheque than a restaurant. 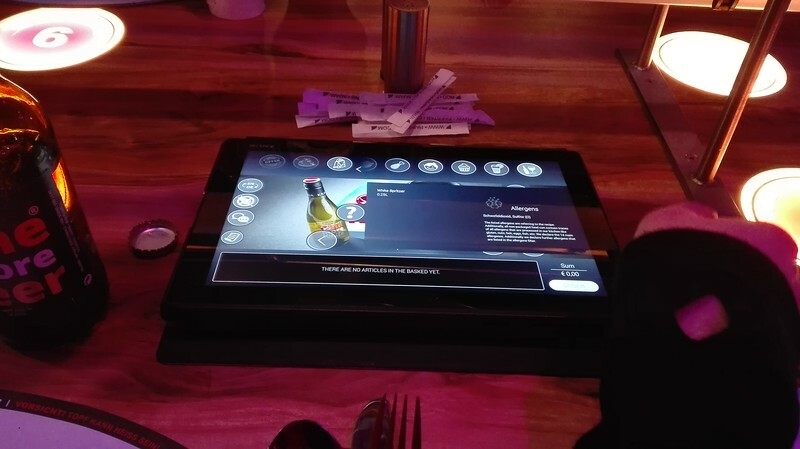 Food is ordered from a self-service tablet and delivered via a roller coaster. But it is tasty and a fun experience. Although I doubt we’ll be doing anything like that again soon. The cold today has taken its toll, so we get to bed early tonight. Wednesday morning we have our visit with the Turkmen consul and afterwards we explore the old inner city. 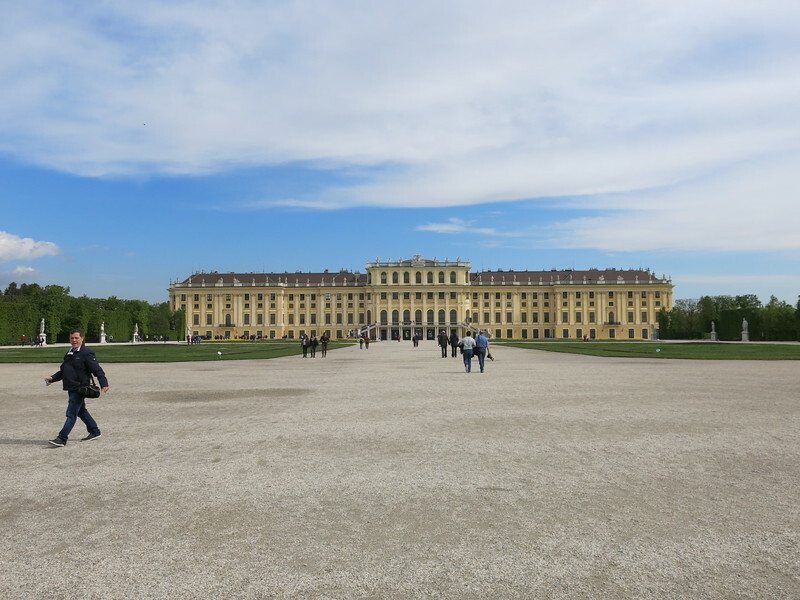 We visit the Belvedere castle, or rather castles, as there’s an Upper Belvedere and a Lower Belvedere, with a large garden in between. 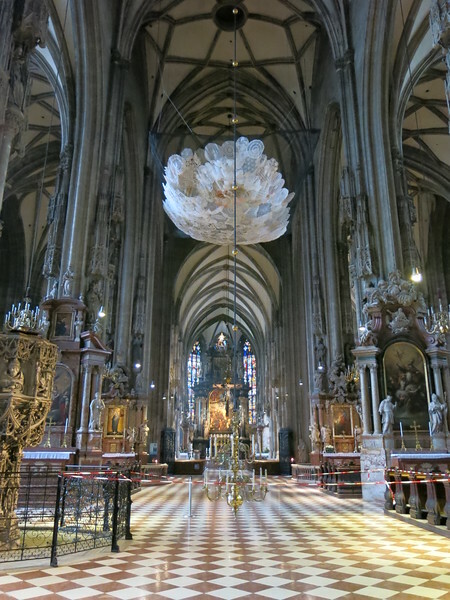 From the many churches in the city, the Cathedral at the Stephansplatz especially catches our attention. It is an impressive building. Even though the mass that is being celebrated when we visit has a rather low attendance. In the afternoon we return to the hotel where Sofie takes a nap. She’s not feeling great as she has been suffering from a toothache for some time now. She had visited the dentist a number of time before we left, but the antibiotics she was given don’t seem to help a lot. 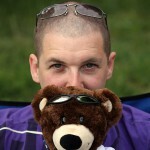 We decide to book an extra night so we can visit Schönbrunn castle tomorrow and see some more of the city. Dinner is wolfed down at a Bierstube on the Judenplatz, near a memorial for the Jewish victims of the Nazis. I try a dark beer. I always thought beers in Austria were mainly Pilsener and Weissen, but apparently there is also a long standing tradition in dark malted beers. The Villacher Dunkel isn’t bad at all. We sleep in a little the next morning, to wait until the morning rush in the metro has settled down. 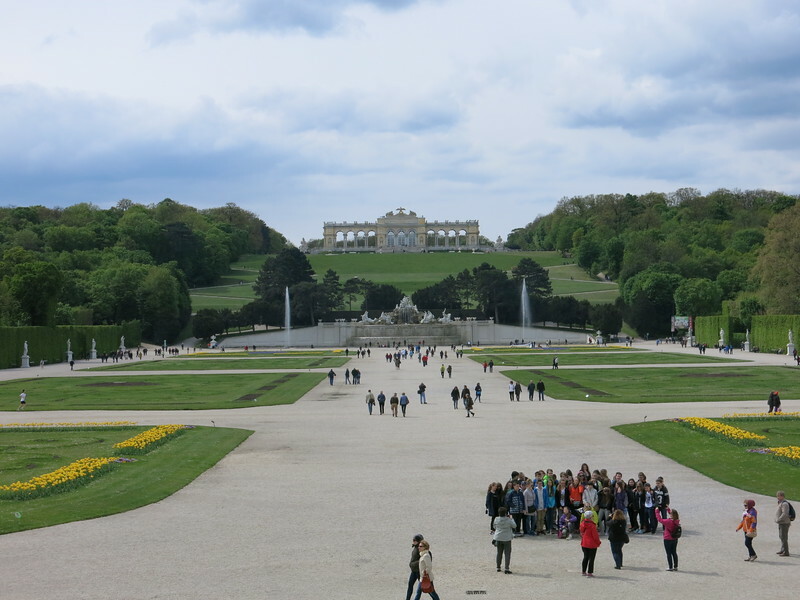 And then it’s on to Schönbrunn, the palace of Franz-Joseph and Elisabeth, made famous in the romance classic movie trilogy “Sissi”. Access to the grounds and gardens is free. The buildings themselves have an entrance fee. The compound is pretty impressive and the palace attracts large crowds, but due to the scale of the place it doesn’t really feel crowded. We walk around for hours until we start to get hungry. Then we take the metro back into the city for some lunch. Sofie is feeling worse again, so we return to the hotel. She starts looking for a dentist that can see her on short notice and has to settle for a dental clinic that takes walk-in patients tomorrow morning. I hope it will work out for her, as she’s feeling a bit down right now and a bit guilty for not addressing the issue sooner. Hopefully it will get sorted and we can cross into Hungary tomorrow on our way to Serbia.